The first of a series, in which we interview people from different aspects of this project - from the producers to the artists - to see how their experience has differed. First up, Diane Manson, double bassist with Scottish Ensemble, offers her perspective on the project from a musician's point of view. Q: What were your first reactions to the idea of being asked to perform, as well as play, on stage? My initial reaction was slight fear. I was excited by the idea, but also apprehensive as it was quite new and totally out of most people's comfort zones. I wasn't sure quite how it was going to go. Q: Did that change after the first couple of rehearsals when you had been introduced to Örjan [Andersson, choreographer] and Paul [Pui Wo Lee, dancer]? When we first turned up we were slightly giggly because we were feeling so nervous, but Örjan was so clever because he very slowly built it up so we’d feel more and more comfortable just moving. He started with simple things like walking in a circle, walking at right angles, changing direction, mirroring somebody - with each step you just felt better and better about it. Also, because he wasn’t at all awkward about us moving, it made us feel OK about it, and we got more and more relaxed. Paul, the dancer, was fantastic as well and made us feel so at ease. To say that by the end of the two days we could do something that wasn't going to be laughed at... I think most of us were relieved that it wasn't pirouettes or demi-plies, it was movement, which made a lot more sense, and again Örjan was very clever on how he got us started with that. He asked us to make noises, so we were immediately coming at it from a musician's point of view. The noises would then have a physical action attached to them, which we could build up to make into a dance. Q: The heart of the piece for many is seeing the musicians doing their solo performances on the same stage as the professional dancers. On those first days, it was very much sprung on you that you had to go into a corner, create an improvised routine on your own, and then perform it in front of each other… How did this feel? When Örjan said “OK, you've got twenty minutes to go and make up a ‘phrase’”, as he called it, most of us just thought "twenty minutes. You’ve got to be joking.” As you say, if we'd known we were going to be performing it on our own... I think it was probably really good that we didn't know that beforehand. It made us freer to do different things. Q: These first rehearsals took place with Örjan and just one dancer. The next stage was arriving in Sweden and seeing what the five dancers had been developing over four weeks. Was it what you expected it to be? Actually, on day one of arriving, the weirdest thing was getting used to playing off iPads! Any movement or dancing was fairly low down on the list compared to getting our heads round how that was going to work. Seeing the dancers moving, everything made more sense, because they were incredible - but yes, at that stage I was still thinking: "how is anything we did in Edinburgh going to fit with that?!" They looked fantastic, they knew exactly how they were doing... I just didn't know how it was all going to mix together. But again, it was a case of building it up, for Örjan too, I think. At those rehearsals he started off with 3 musicians and 5 dancers, then he had four musicians, then the rest of the band arrived, so it was constantly developing right up to the last day. Q: So, you’d built a production, you’d had a dress rehearsal: what was the comparison to the feeling you got on the actual opening night? By the time we'd done the dress, people were feeling more confident about how it was going to pan out. Not so much in terms of the movement, but being separated from the other musicians on the stage. For us, that was one of the biggest challenges. 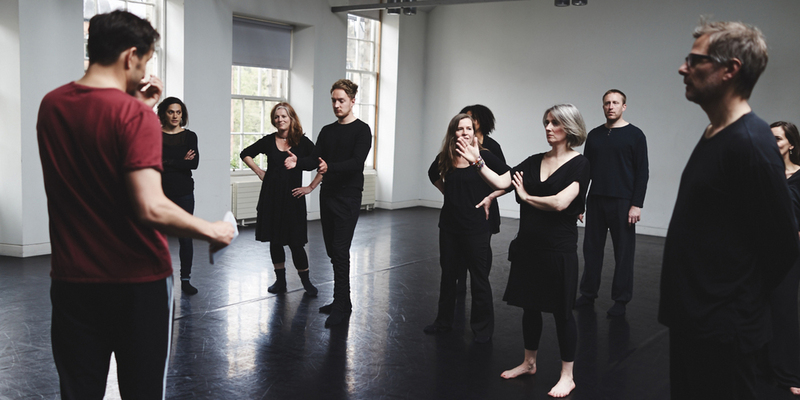 As Jon [Morton, Artistic Director of Scottish Ensemble] kept saying, we had to start listening in a completely different way to how we normally would - and watching, too. We had to communicate with each other differently, particularly in anticipating everything a lot more. The basses and cellos were right at the back but the violins were playing antiphonally, really. I think by the dress, we were just relieved that we felt like we had that working. Q: One of the benefits of playing with Scottish Ensemble is that you have known the other musicians for a long time. How easy was it to work with dancers who you've never met before and had to get to know over such a short space of time? The dancers have been quite incredible - so warm and open from day one, with real, genuine care and concern for everyone around them. There's never been any sense of them and us. I was thinking, for the dancers it must have been quite hard as we're an established group, socially, but we've really spent time with them and socialised quite fluidly. They've been so encouraging and helpful with warm-ups. I was casually bending down to stretch my back one day and before I knew it there was a dancer behind me helping me. Q: There are lots of new things in this project, such as being involved in decisions about movement, thinking about how to move around a stage... Do you feel you're using a different part of your brain, creatively? It's definitely more exhausting. All of us have noticed how tired we've been. There's just so many more things to concentrate on. One of the things we’ve found, in terms of processing things differently, is that when we've had to move around quite a lot in one of the pieces, then we go back and have to play, it's not great for us because as musicians. We need to keep the heart rate very low, calm and contained - otherwise, it's hard to play without feeling jangled and out of control - whereas the dancers need that high heart rate for what they do. So that's been a real challenge for us - managing that high heart beat, then getting back to your seat and trying to calm down and control your digits so that you still feel focused. Q: The idea behind this collaboration was to bring music and dance together to create a piece where both elements play an equal part. What is it like to take part in that kind of thing? Q: What about classical music in general being presented like this? Q: The way the audience has behaved has also been different to what you’d expect from a ‘normal’ classical performance - there is a sense of real curiosity, interest, laughter. Have you felt any of that on stage? Diane Manson is a double bass player for Scottish Ensemble, which whom she has been playing for 20 years. She started playing bass at the age of 16 because “my hands were big enough”, and went on to study at the Royal Conservatoire of Scotland. She spent 10 years in London playing with groups from the Royal Philharmonic Orchestra to The Academy of St. Martins in the Fields as well as recording for film, TV and pop artists. She now lives in Derbyshire, where she works with the BBC Philharmonic and the Halle and is Co-Principal Bass with Manchester Camerata.